Post-theism doesn’t deny our need for salvation, only that we should expect it from elsewhere. Moreover, it’s not about getting rescued or delivered to a better place, free of enemies or bodies to drag us down. Such themes are common in so-called popular religion, particularly its theistic varieties, where believers are conditioned to anticipate the liberated life as a future and otherworldly glory. In the meantime they are expected to stand with the congregation, honor tradition, and stick to the script. It’s not that post-theism opposes these as a “new evil” from which we now need to be saved, as when religion is made into the enemy by secular modernists who condemn it as backward and closed-minded. If we even use the term, salvation – literally referring to a process of being set free and made whole – has to do with the liberated life right now for the one who has dropped the illusion of being somebody special and getting it right. Post-theists are more likely to seek genuine community than merely stand with the congregation, to press for contemporary relevance over turning the wheel of tradition, and to flip the script from final answers to more profound questions. Our task, then, is to refocus our human quest (with the secularists) on the present world, but also (with some theists) on what is beyond the world we currently have in view. My returning reader is familiar with the view of constructivism that regards ‘the world’ as our shared construction of meaning, inside of which we all manage our individual worlds of more personal meaning. The world we have in view, in other words, refers to our current perspective on reality, not to reality itself. The really real is beyond our collective and individual worlds, but it is in our worlds (not in reality) where our predicament is located. Rather than trying to illustrate this in the abstract, let’s make it personal. Reflect for a moment on your personal world, or more accurately, on your worldview. It’s not exactly the same as anyone else’s, is it? Your worldview overlaps and agrees with some others, but there are critical differences as well. 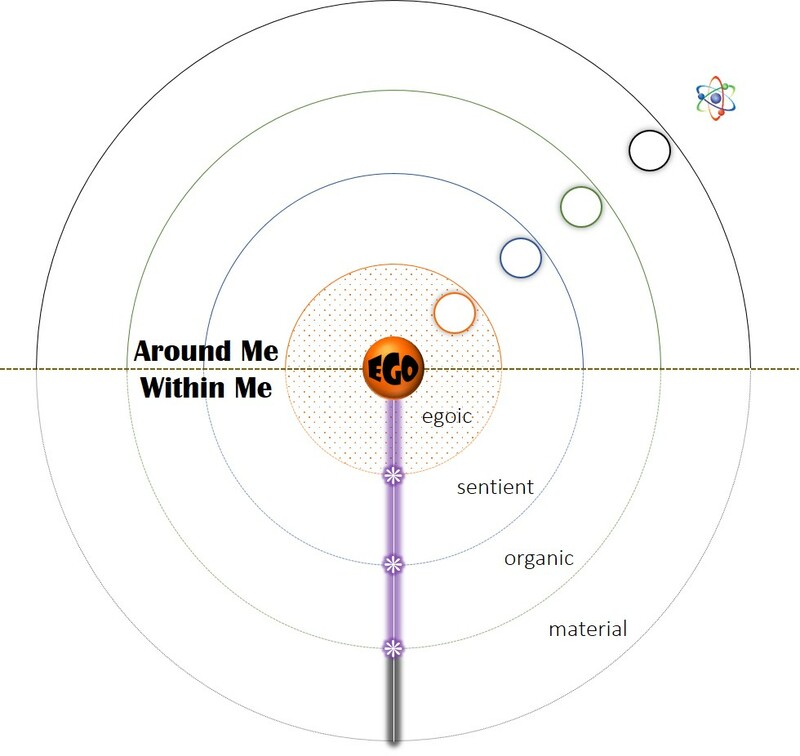 The unique elements in your personal world are reflective of your individual lifestory – referring to the autobiographical narrative (or personal myth) that you identify yourself by. Your lifestory is a reductive selection from the stream of experience which is your life: arranged, modified, and much of it invented in the work of constructing a coherent sense of who you are. 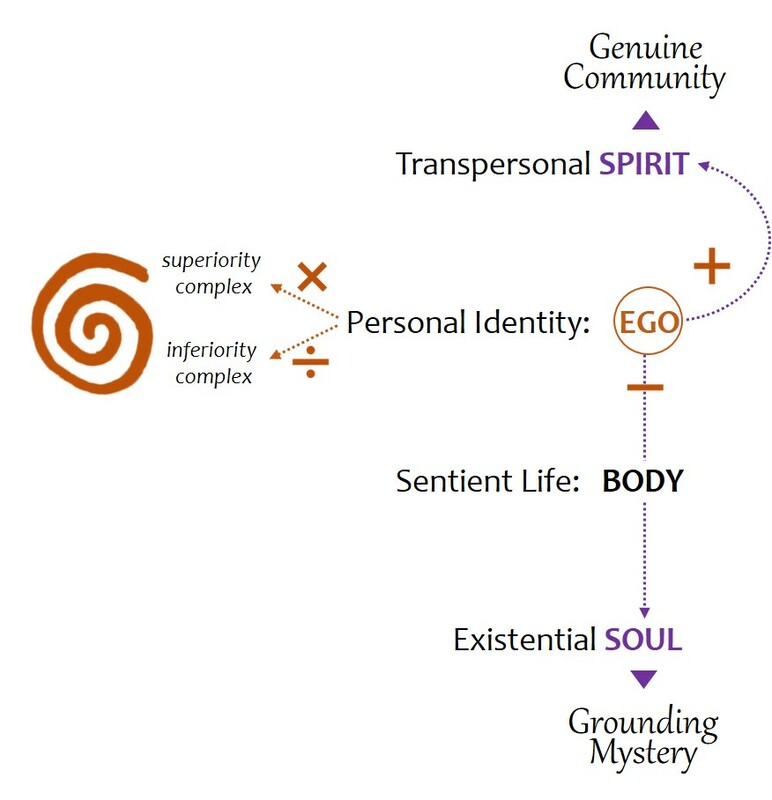 The personal identity carried in your lifestory is therefore less than what you are in your totality – the human being of a certain genetic makeup, temperament, background, aspirations, and life experiences. In fact, it is nothing more than the persona you project to others and reflect back to yourself for validation and judgment. From Latin, persona refers to an actor’s mask through which she animates a character on stage. The mask is just an assumed identity, but it lives in a story and interacts with other actors in the progression of scenes. Good actors make us forget that they are acting a part. You, too, have become so good at acting through the persona of identity that you sometimes forget it’s just somebody you’re pretending to be. Or maybe you’re like the majority of us and haven’t yet caught on to the game we’re all playing together. 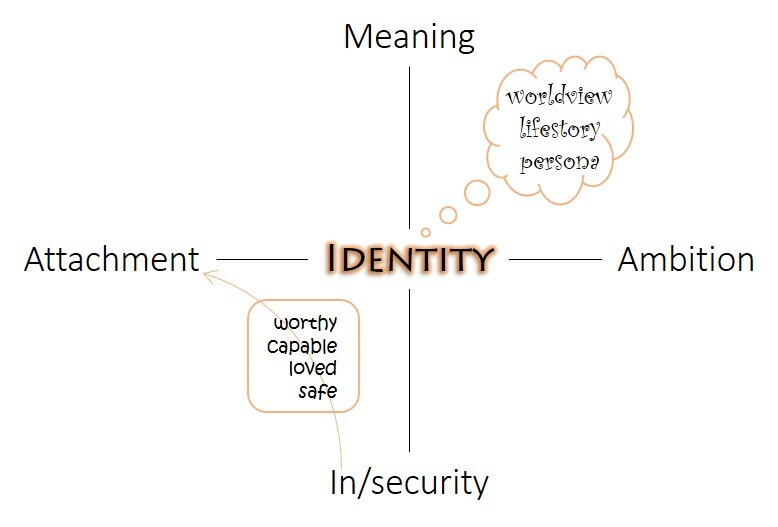 In my diagram I have put your persona (what you project to others), your lifestory (that highly filtered and refashioned personal myth), and your worldview (the construction of meaning you use to make sense of things) inside a bubble which is meant to represent the illusion of your personal identity. I also use a fancy font to remind you that all of this is one big somewhat magical fantasy. 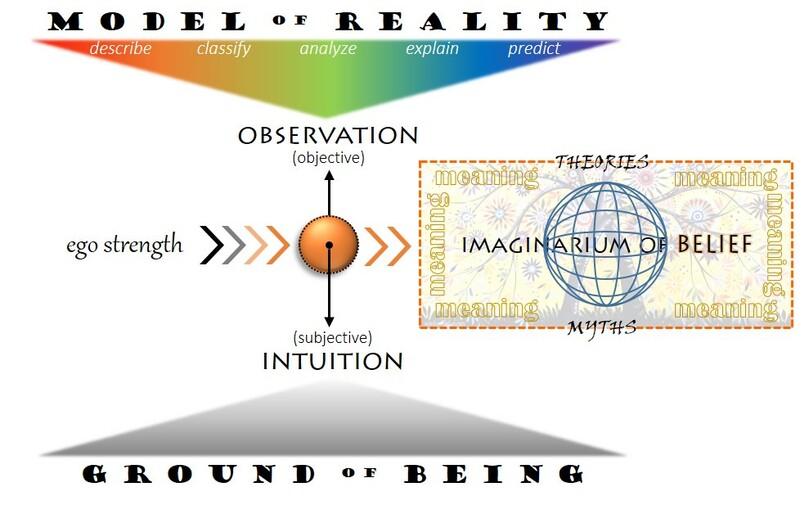 You should be able to analyze each ‘level’ of this fantasy and confirm how illusory it all really is. But here’s the thing: most of us don’t understand that our identity is just an illusion. To understand that, we would have to see through the illusion instead of merely looking at it and mistaking it for reality. 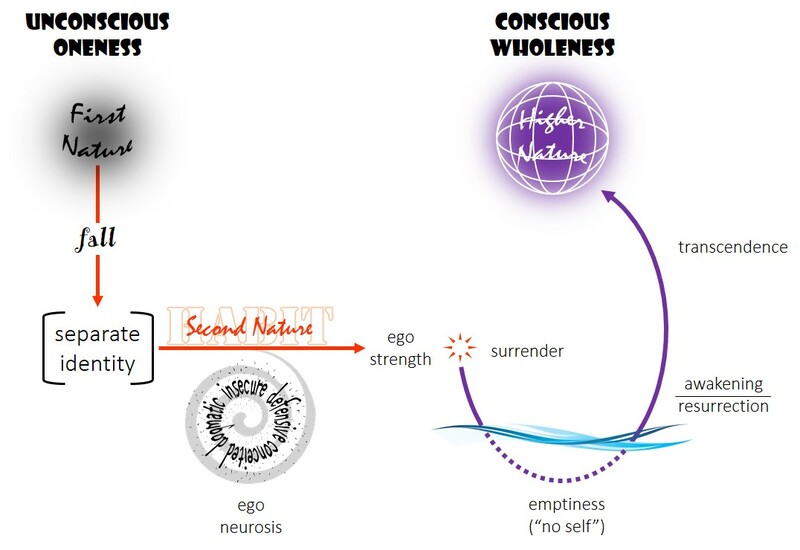 What might otherwise serve as a ‘positive illusion’ – referring to a belief system that positively orients us in reality, connects us meaningfully to others, and supports our evolution as free, creative, and responsible individuals – becomes instead a delusion in which we are stuck. This is the predicament that our salvation resolves. As a delusion, the unrecognized illusion of identity devolves into a profound sense of separateness from each other and everything else. Our frame of perception collapses to the horizon of personal concerns, only to what affects us and our own interests. Because the project of identity is not self-standing but depends on the assent and approval of other actors equally deluded, ego (the part of us that is pretending to be somebody) is inevitably insecure to some extent. 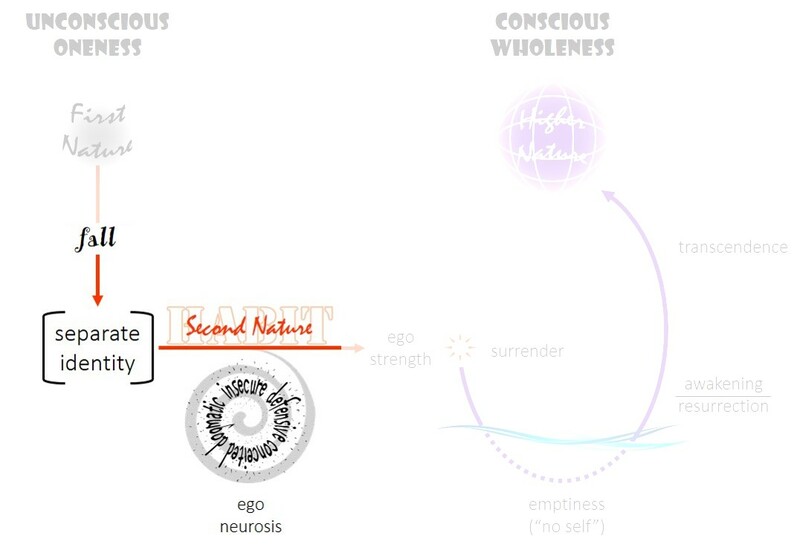 Of course, we want to be secure, so we form attachments to the world around us, which we hope will make us feel safe, loved, capable, and worthy – what I name the four ‘feeling-needs’. We all have these feeling-needs, and it’s only a secondary question whether we might be safe, loved, capable, and worthy in fact. The point is that we need to feel these in some positive degree in order to have security in who we are. The deeper our insecurity, however, the stronger our attachments need to be, since they are supposed to pacify us and make us feel good about ourselves. And as attachments require that we give up some of our own center in order to identify with them, the delusion grows more captivating the more scattered our devotion becomes. In the diagram we have moved from in/security to attachment, and from what’s been said about attachments it should not be difficult to see where ambition comes into the picture. An ambition has a dual (ambi) motivation, combining a desire for the object and its anticipated benefit (feeling safe, loved, capable, or worthy) with a fear that the object might not be there as expected, might not stay around, might be taken away, or in the end might not be enough. Ambitious individuals are praised and rewarded in our society, which goes to show how deep in delusion a family, tribe, or nation can get. A system of meaning called an ideology (or on a smaller scale, an orthodoxy) enchants an entire culture into believing that this is the way to authentic life. 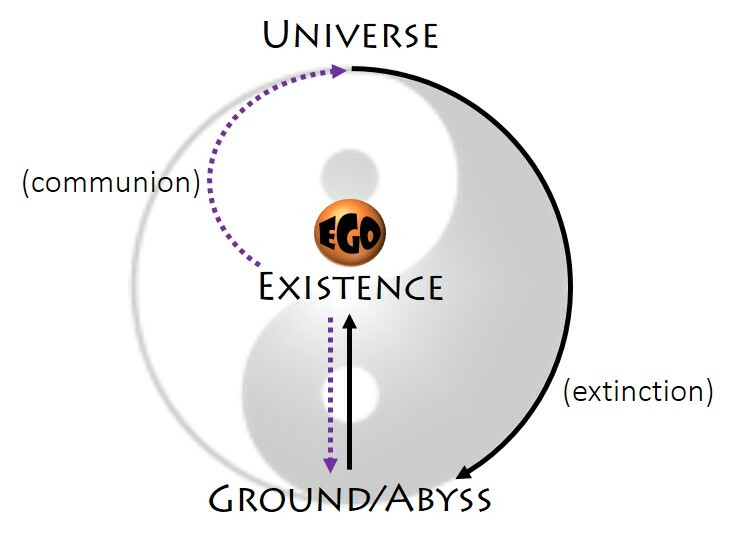 As we come full circle in my diagram, we need to remember that meaning is not a property of reality but merely a construct of human minds. Your world is one construct of meaning, mine is another; and together along with millions of other ambitious persons we spin a web that holds us hostage in a world of our own making. Our salvation is not a matter of throwing ourselves with full commitment into this world (the secularist mistake), but neither is it about getting delivered from this world to another one somewhere else (the theistic mistake). Instead, salvation comes as we awaken from delusion and begin to see through the illusion of who we think we are. Only then can we get over ourselves and fully embrace our creative authority, working together for genuine community and the wellbeing of all.